Utilizing the video editing tricks, professional video editors use to make their work more appealing to the audience can help you produce better video clips with Filmora Scrn. The fade-in effect is commonly used to slowly introduce a shot to a viewer but it can also be used to make the transition between two shots much smoother, especially when combined with the fade-out effect that is often used to conclude a shot or suggest the end of a sequence or the entire video clip. 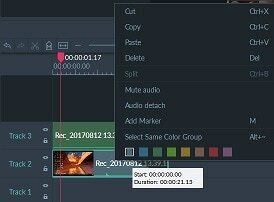 You may already know that professional video editing software packages, like Adobe Premiere, enable its users to add fade-in and fade-out effects to videos, but in this article, we are going to show you how to create perfect openings and endings for your video clips with Filmora Scrn in just one click. So let's explore the steps you'll need to take in order to add these effects to your videos. Adding the fade-in and fade-out effects to your recorded videos with Filmora Scrn is an uncomplicated process, which can help you create visual content that is more pleasant to watch and that leaves a professional impression. If you've just completed a screen recording session with audio recording via Filmora Scrn, your file will be automatically imported into the software's video editor. 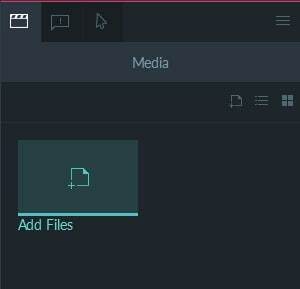 However, if you want to use the footage that was captured with a camera or some other screen recording software, you can easily import these files into Filmora Scrn, by clicking on the Add Files in the editor's Media Bin for Filmora Scrn supports most of the popular video and audio formats. 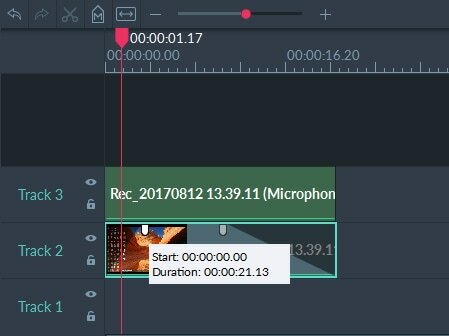 Drag and drop the video clips you want to use in your project to the timeline and proceed to magnify the timeline tracks by adjusting the Zoom In/Out slider located directly above the timeline. Zooming into the track on which the video clip is located will enable you to spot the fade-in and fade-out handles easier. The fade-in handle is located at the very beginning of the clip, while the fade-out effect can be found at the very end of the video clip. If you would like to add a fade-in effect, simply drag the handle to the right, and if you want to fade-out to black simply drag the handle located at the end of the clip to the left. You can click play and see how the effects you added look like on the editor's preview screen. The Opacity and Speed features are located in a toolbar on the right side of the screen. Changing the playback speed will make the fade-in or fade-out effect faster while adjusting the Opacity value will alter the transparency of the effect you applied to the video clip. Keep in mind that you'll have to find the right measure for each of these values in order to properly enhance the fade-in and fade-out effects you applied. For the recorded microphone audio, you can drag the fade handle at the beginning or the ending of the audio file to make fade-in and fade-out audio effect. But, if you want to split the audio from the video and fade in/fade out the recorded screen audio file, all you need to do is right-click on the audio file in the timeline and select the Audio Detach option. 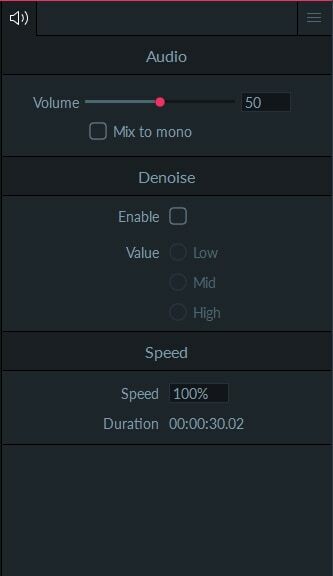 Then, you can fade in and fade out your audio files easily. After you've separated the audio file from the video clip, you should select it and proceed to adjust the audio settings. Filmora Scrn enables you to change the volume of the audio file, mix it to mono, and you can also experiment with the audio playback speed or use the Denoise feature in order to remove the noises you accidentally captured during the video recording session. That's how to add fade in and fade out effect quickly to recorded video with Filmora Scrn. As you can see, the steps are very easy. So, why not download Filmora Scrn now and give it try?